A Bubble Show is something unique and unusual for your party with beautiful giant soap bubbles to stand inside, and much more. Our bubbles have a fun Wow Factor! 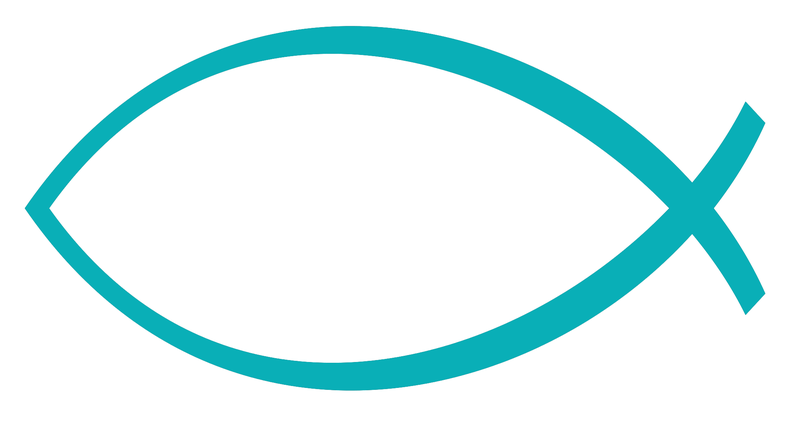 The entertainment is interactive and suitable for all ages at parties, weddings, christenings, corporate events, festivals, youth clubs, schools, special schools & nurseries. Our Bubble Show, enhanced with music, is gentle, informal and lots of fun for children and for adults. We create bubbles for everyone to watch, a bubble hairdresser, bouncing bubbles, bubbles in bubbles and rainbow bubbles. At children's parties the birthday child can help us to make these. We will use dry ice to create exciting "smoke" and volcano bubbles and touchable "smoke" filled bubbles for everyone to hold. 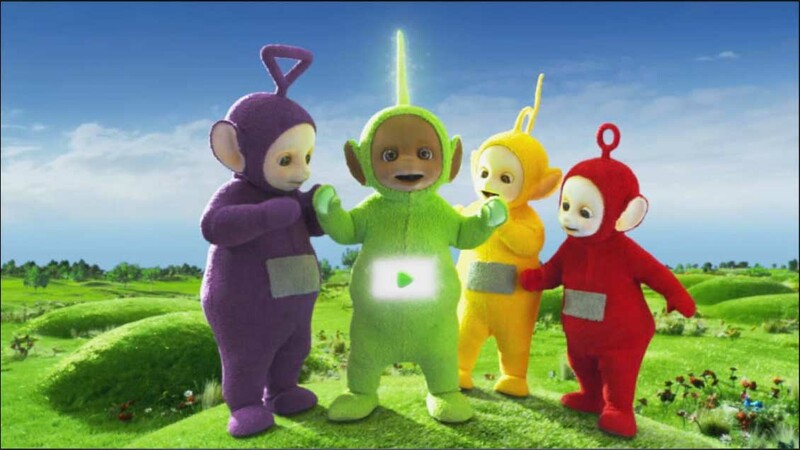 Then we put everybody inside giant bubbles and giant rainbow bubbles, which they love! Bubbles will come down over a wheelchair user too. At children's parties experienced early years teacher Bonnie will keep the children quietly fascinated for an hour and they join in rather than just watching. 25 children is an ideal maximum. A draught free performance area 3m x 3m is ideal with 2.5m height for the giant bubbles. The floor in your home or venue will be covered so there is no mess for you to worry about. 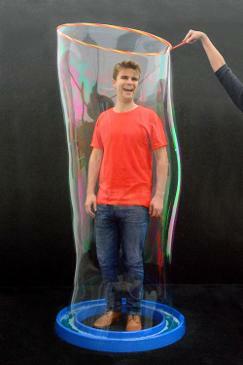 Our beautiful giant bubbles are ideal for parties and events where you would like low cost, informal entertainment. Lots of fun for all ages: 1st birthday parties, toddlers, young children, teenagers and young people. Fun for Youth clubs and adults too! We create giant bubbles for everyone to have turns standing inside. 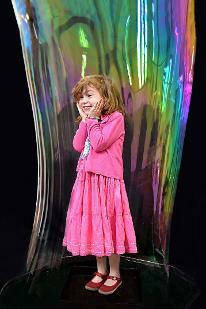 Children can go in a bubble with their parents, siblings and friends and can try making their own giant bubbles. We make wonderful giant rainbow bubbles for couples or children to stand inside together and we bring our giant bubbles down over a wheelchair user. Bubble fun for everyone! 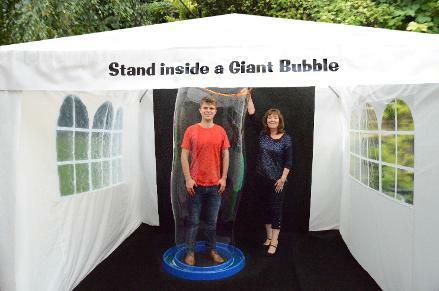 For parties and events outside in the spring & summer we can do an Interactive Bubble Show for you with our bouncy bubbles, bubbles in bubbles, bubble hairdresser, "smoke" and volcano bubbles and giant bubbles for everyone to stand inside. Our gazebo shelters the bubbles from any breeze. 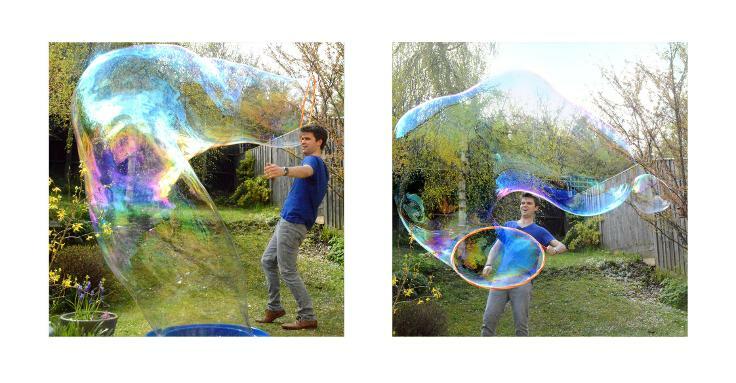 Children and adults can enjoy having turns creating their own beautiful big bubbles. Informal bubble fun outside. If you wish, our photographer Dan will photograph everyone inside their giant bubbles. You may purchase these as JPEGs or as mounted photographs or photo key rings ready at your party or event. Please see the Photography page for details.